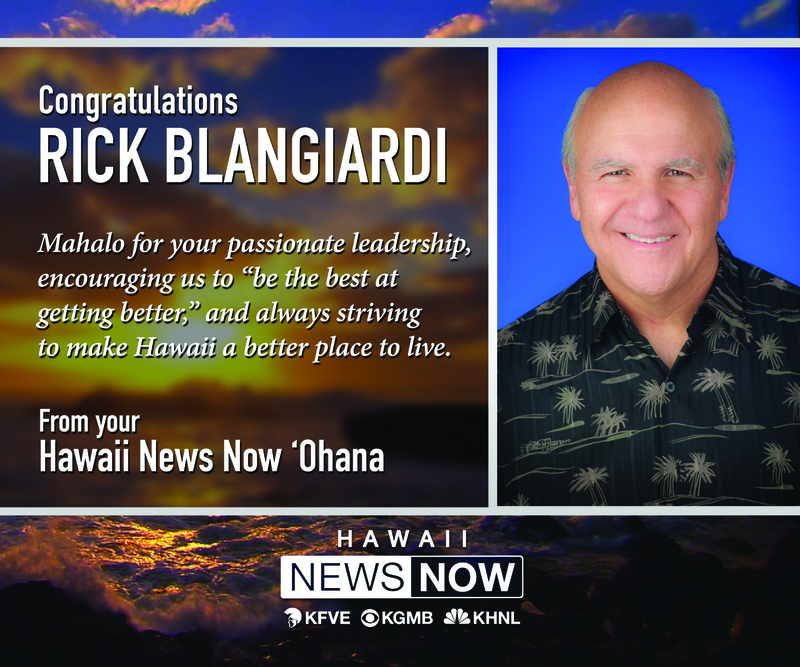 Rick Blangiardi has led a life of uncompromising service to Hawaii, his colleagues and family. He is currently the General Manager of Hawaii News Now, KGMB (CBS) and KHNL (NBC). Prior to his career in broadcasting in 1977, Blangiardi spent seven years as a college football coach, five of those at the University of Hawaii, where he received his M.A. in 1973. In 1977, he began working as an account executive, local sales manager and general sales manager at KGMB. By 1984, he became VP/General Manager of KHNL; then moving to senior TV management positions in Seattle until 1993 when he relocated to San Francisco. There he served as VP/GM of KPIX, Group President of River City Broadcasting, and President of Telemundo station group, helping lead the sale of Telemundo in 2001 to NBC for $2.7 billion. 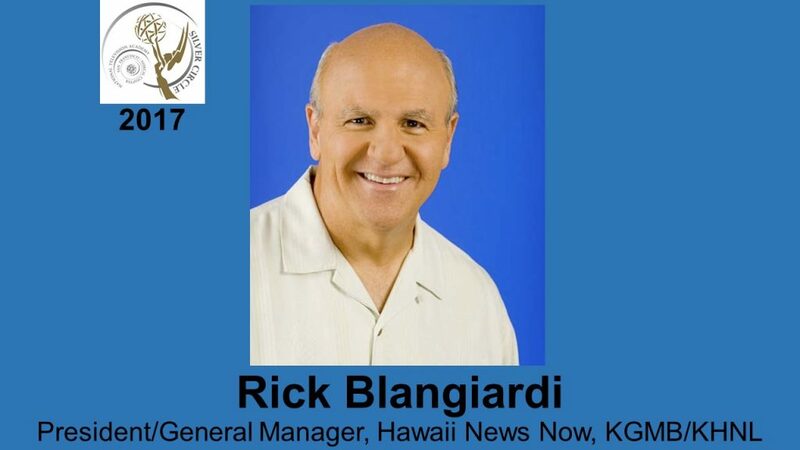 By 2002, Blangiardi returned to Hawaii, first to become Senior VP/GM of the KHONKGMB duopoly, then KHON (2005-2006), KGMB (2006-2009), and finally in 2009 adding Hawaii News Now. 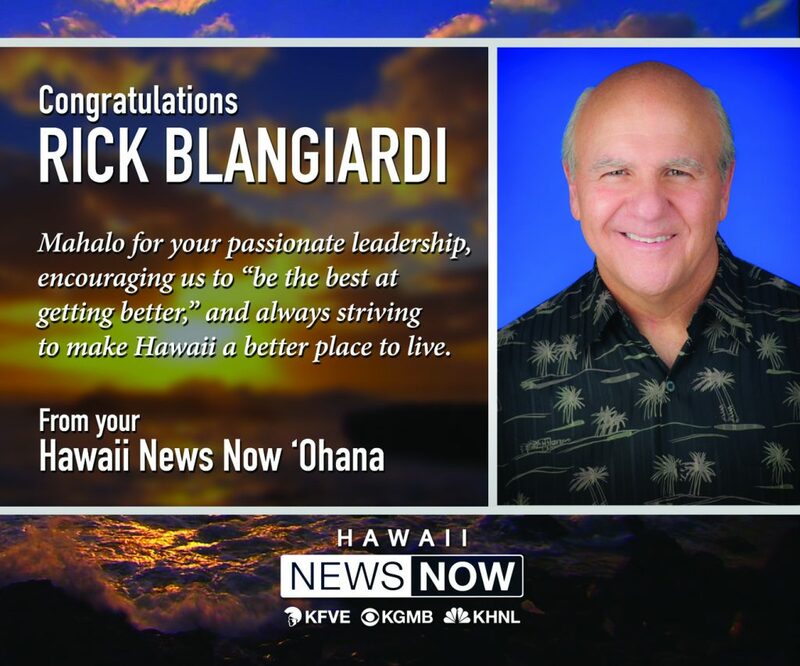 Blangiardi has helped lead the station’s relentless advocacy work on the plight of Hawaii’s Homeless, and has been nationally recognized by the Joyful Heart Foundation towards the battle to end domestic violence and sexual abuse. His volunteer leadership roles include Past President for the Aloha Council, Boy Scouts of America; Chair of the Board, Chamber of Commerce of Hawaii; and Past President of Na Koa, the University of Hawaii Football Booster Club. He was named the University of Hawaii’s “Distinguished Alumni” in 2014, and “Hawaii’s Distinguished Citizen of the Year for 2015” from the Aloha Council-Boy Scouts of America.